I, unfortunately, haven’t reached the point in my life where opening $50 bottles on weeknights is financially feasible. Maybe one day I’ll get there, but until that point, I’m on the constant lookout for great weekday value wines. Wines under $20 that are interesting, well made and make me feel like I’m not wasting any one of what my doctor calls the “maximum amount of healthy drinks per week.” And the truth is, there are plenty of regions and/or varietals in the world (that are not California Pinot) where you can find good wine, even great wine, in that range. 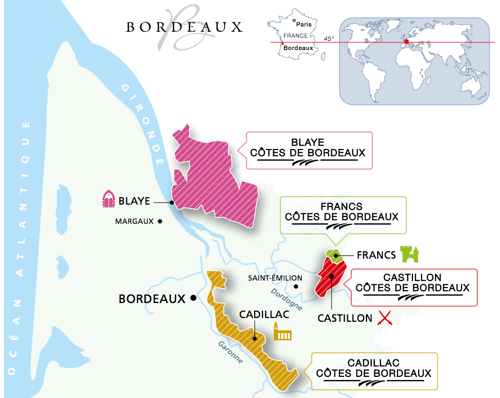 One of those regions is Côtes de Bordeaux. Côtes de Bordeaux represents about 10% of the total production of Bordeaux wines. However, it is its own appellation, representing four areas of land that fall just outside the Bordeaux AOC. And you know what happens when wine regions fall just outside of incredibly popular and expensive wine regions like Bordeaux? You find good deals on similar wines that are grown in very similar terroirs that use the same grapes as those in the expensive regions. You just don’t pay for the name. So, yes, wineries from Côtes de Bordeaux can set their sights on making great everyday wines and charging you a fair price for them. 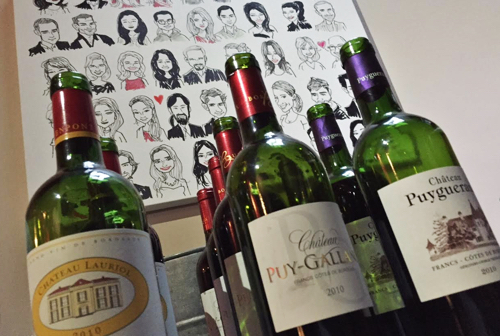 At a recent event put on by the Côtes de Bordeaux we tasted through a number of wines from each of these four areas: Blaye, Cadillac, Castillon and Francs. It was a really cool event held at a private loft space in Boston with a meal prepared by an ex-Craigie on Main chef to highlight these wines in a “home-cooked” setting. The food was fantastic (not necessarily something I could personally cook at home) but the point was made nonetheless. These wines shine when paired up with rich flavors and dynamic food, even in the low-key ambiance of a Leather District loft. I asked the resident sommelier of the evening (another Craigie on Main representative) if he found any particular differences between the wines of the four Côtes de Bordeaux areas. He didn’t say that there was anything that particularly stood out to him, and I can’t say I could find any major differences either, but there were certainly commonalities between these wines and their brethren in Bordeaux. As a broad generalization, these Côtes de Bordeaux wines tend to be Merlot dominant, with ripe red fruit. 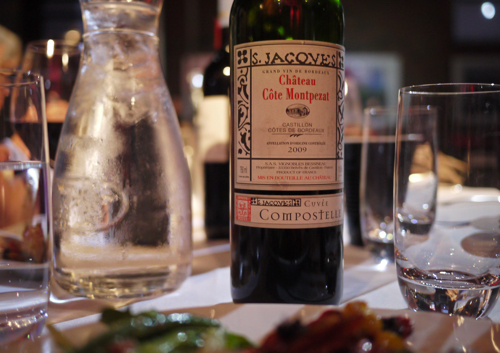 Many of the wines were layered, complex, earthy, well structured… all of the things you’d hope for from Bordeaux wines. Just at more reasonable prices. Here are a few of my favorites from the tasting–all I may add in that $20 or less range. If you’re wondering if any Côtes de Bordeaux wines surpass the everyday drinking $20 and under range, the answer would be yes. Although it seems that this is an exception not the norm. 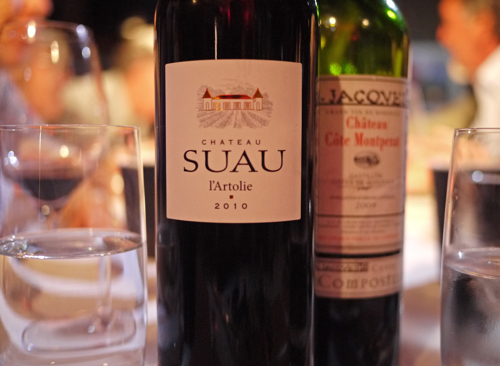 One wine in particular that stood out during the dinner was the 2010 Suau L’Artolie, Cadillac Côtes de Bordeaux. I didn’t know it at the time, but this was the only wine in the tasting lineup that reached into the $50+ range (about $60 retail). Although, in retrospect, I now understand why I kept refilling my glass with it! This wine, while perhaps a far reach from the everyday drinking budget, is gorgeous. A testament to the potential of this slightly-in-the-shadows AOC. If you’ve been reading intently, you would have noticed by now that I haven’t mentioned white wines at all. Interestingly enough, while white grapes such as Sémillon, Sauvignon and Muscadelle are grown in the Côtes de Bordeaux, the white wines that come out of this region are actually designated as part of the Bordeaux AOC. Not the Côtes de Bordeaux AOC. Which is weird. I know. Then again, nobody ever said that French wine laws and regions were easy to understand. What is easy to understand, however, is value. And from that perspective, the red wines of Côtes de Bordeaux are absolutely worth getting to know–especially for those weekday dinners, but even for that special evening. Thanks to Alexa and the Teuwen Communications team for organizing a great event.